Dress People Ltd - Illusive Design Inc. Dress People Ltd. offers fabulous bridal parties at affordable prices. Bridal Gowns, Bridesmaids, Mothers, Prom, Sweet Sixteen, Quincenera, Formal/Gala, Cocktail & all the accessories to complete your special look.Wedding and party gowns, dresses and accessories seller located at the heart of downtown Brampton. OpenCart, Web Server space and data entry. 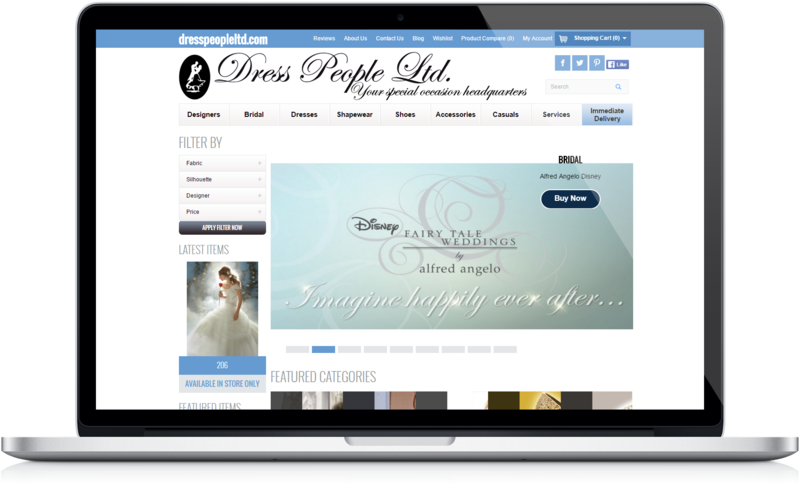 Dresspeople utilizes an OpenCart-based website design offering premium quality design collections for a variety of occasions. The website offers an inside look into Dress people’s retail operations headquartered in Brampton, Ontario. The Dresspeople site offers 24/7 access directed at a clientele that are looking to access the newest in released merchandise. Through the website, a customer can view a variety of photos of the latest that Dresspeople have to offer. The aim of the design here is to encourage a customer to make a purchase at the company’s brick-and-mortar location. In a sales-based site such as this, a fully responsive design is of utmost importance. This is what ensures that your customers remain on your site and that they don’t leave for a competitor. Through the efforts of Illusive Design, we built a complex yet fully responsive design that keeps clientele browsing through the products at Dresspeople and slowly offering them pathways to the company’s online e-commerce interface. This online boutique is complete with everything that a customer needs in order to make their purchase then and there. Through our hard work and expertise in website design, Dresspeople now have a fully optimized e-commerce site design that is working for them and their customer base. This facilitates the conditions in which their company brand can grow in the months to come. 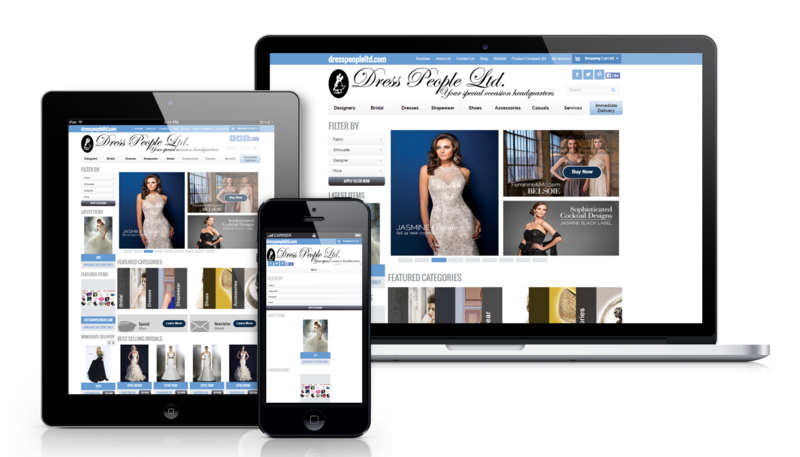 Complete with a complex and fully responsive design, Dresspeople are equipped to handle their customer base with a site design that’s an accurate depiction of their retail services. 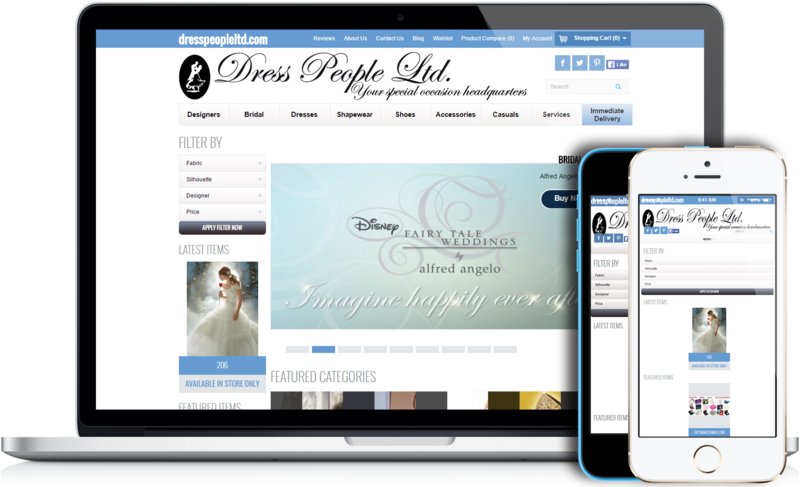 Dresspeople’s complex e-commerce website design includes PayPal payment gateway integration, making it easier than ever before for a customer to make a purchase right then and there. This means that customers have to put in minimal effort in registering their purchase thereby facilitating an easier and more natural exchange. This interface is equipped with the latest internet security technologies ensuring that Dresspeople’s customers are appropriately protected throughout the payment process.